DADGAD is an alternate tuning. Alternate tunings are pretty much what they sound like: an alternate way to tune the guitar. They’re a great way to come up with new ideas when standard tuning starts to get old. I’m going to talk about one of the most popular ones: DADGAD. Low E string: tune to D a whole step lower than low E; should be an octave lower than the 4th string. Re-tune slowly so that you don’t break strings. I’ve broken more strings tuning down than tuning up. Releasing tension can do that. These frets outline the D dorian scale. You can play them as a sequence from fret 5 to 17. Or you can play them in any order you want. Play each fret while strumming the other strings. Think of the result as chords by playing each one for at least four beats. This allows you to get a sense of each sound. Once you have a sense of what each fret sounds like with the other five strings, create some progressions. 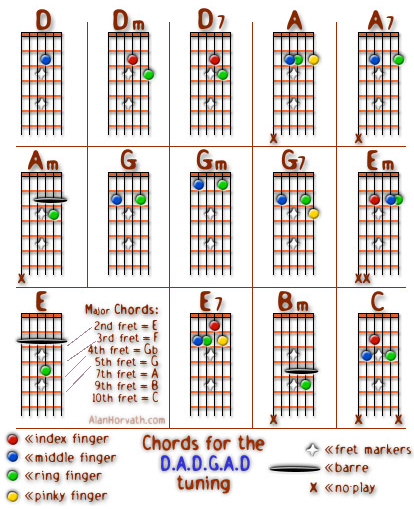 Try strumming the 5th fret for a bar, followed by the 10th fret for a bar, then the 7th fret for two bars. Repeat. This should give you some ideas for your own stuff. By the way, I haven’t tried that particular pattern. I like to write patterns away from the guitar then try them out later. This means that habits that I have when the guitar is in my hands don’t control what I do. New stuff happens more regularly. For those of you wondering about shapes that produce conventional chords with DADGAD, here you go. 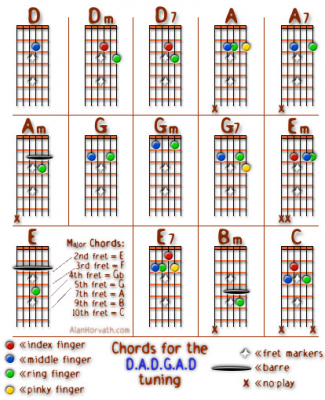 It’s good to know these if you want to go from a more conventional sound to an invented chord. The drone of the five unfretted strings might be too much for you after a while. Experiment with eliminating strings. Try strumming the first three strings. Or the first two. Or whatever. Find variety. Using notes on other strings is good for adding variety, as well. I’ll talk about this in the next post.